In part 1 of this series, you were introduced to the NetBeans Platform build system by Hermien Pellissier, who works on NetBeans Platform applications for the South African National Defence Force, at Saab Systems Grintek in Johannesburg, as explained here. 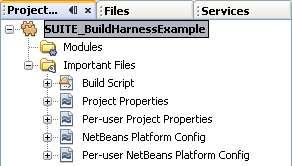 Now, in part 2, she introduces you to NetBeans Platform project structures, user folders, and the build harness. 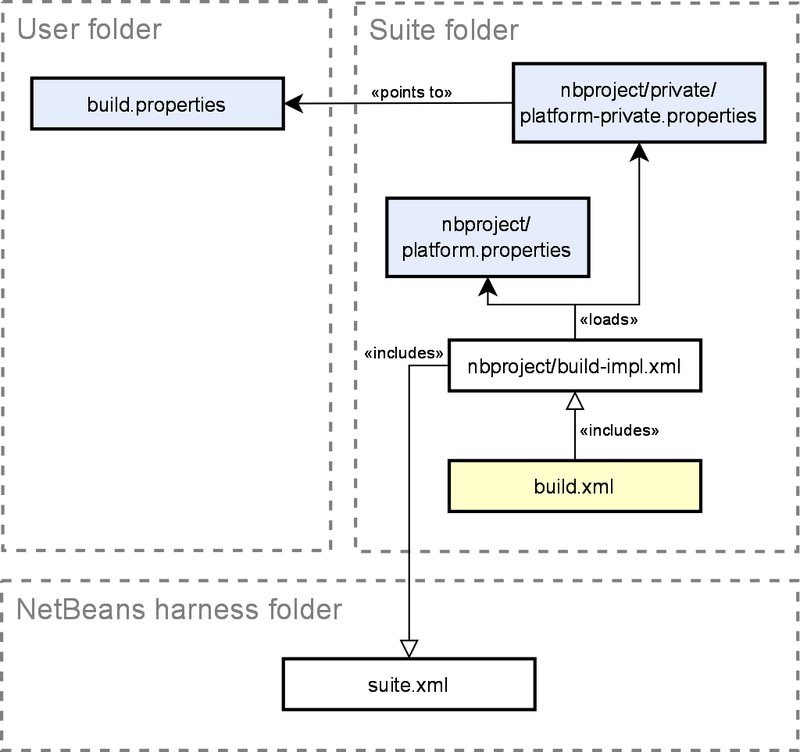 Firstly, a brief look at the physical structure of a NetBeans Platform project. This is again something that the developer often does not need to know much about since the IDE manages all the details for you. However, when exploring the build harness, this is a good place to start. Figure 2. A new Platform Application in project view. Figure 3. A new Platform Application in files view. The build.xml file is the main project build file (called Build Script in the projects view). This file includes the build-impl.xml file in the nbproject folder. The developer is free to edit build.xml since all the automatically generated build details are kept in build-impl.xml. 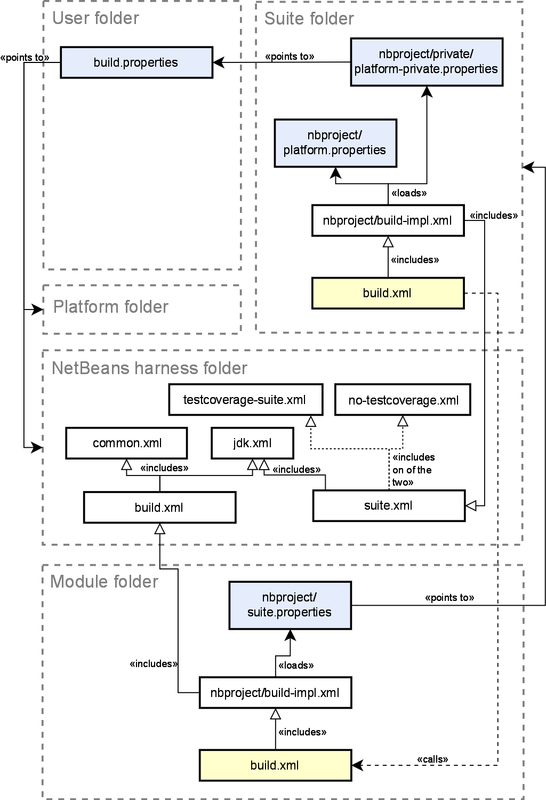 nbproject/platform.properties: This file indicates which platform to use and which platform clusters and more specifically modules form a part of the suite. nbproject/private/platform-private.properties: This file specifies where the user folder, and more specifically build.properties, is located. Note that the files in the nbproject/private folder is by default not checked into source repositories. The idea behind the folder is maintaining data that is private, i.e. specific to a PC. The build-impl.xml file (as well as build.xml) inherits all the targets from the build harness scripts, such as build, clean, debug, run and build-zip. nbproject/branding folder: The splash screen and other branding related data is stored here. nbproject/private/private.properties: Information that is private to the project in your IDE, such as which files were open the last time the project was saved. 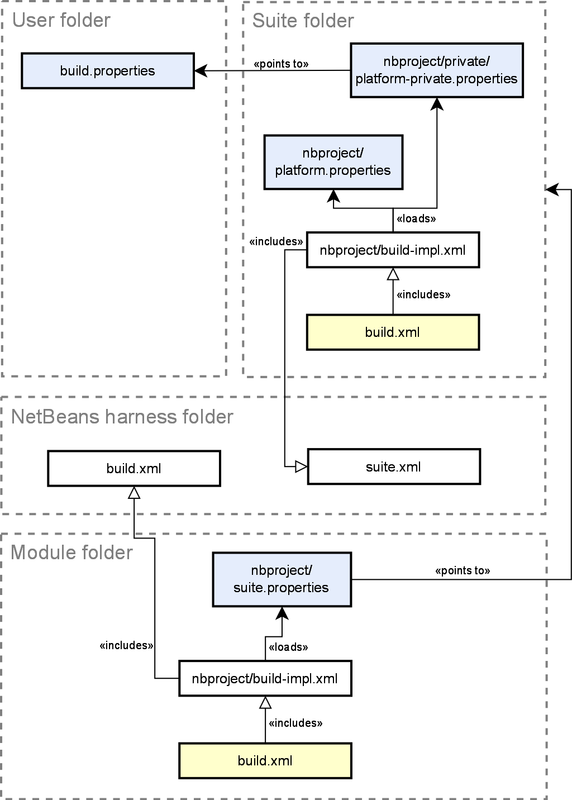 nbproject/genfiles.properties: Used by NetBeans to maintain the integrity of generated files. Do not edit. 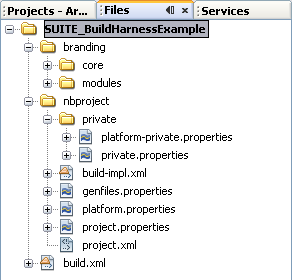 nbproject/project.properties: Properties of the suite such as the application name. 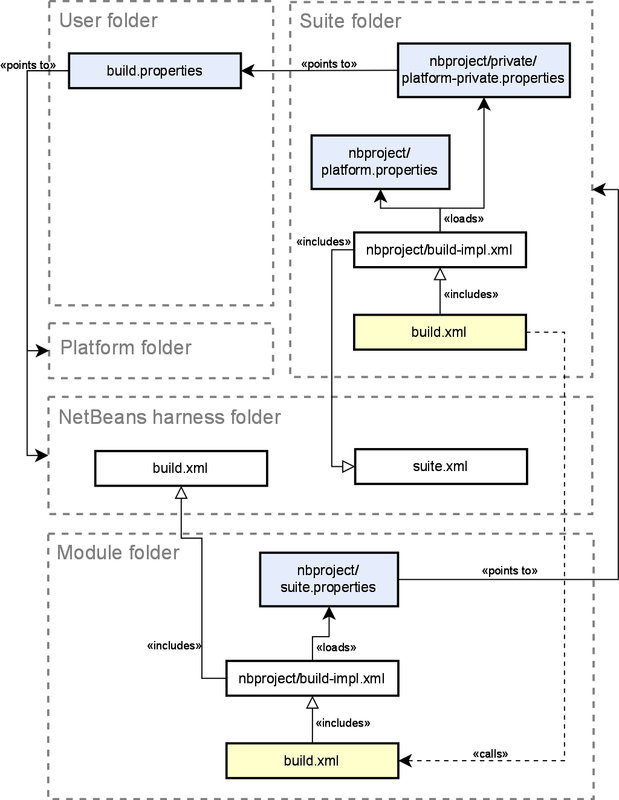 nbproject/project.xml: It contains the settings that the IDE requires to handle the project, indicating that it is a org.netbeans.modules.apisupport.project.suite project. Figure 4. 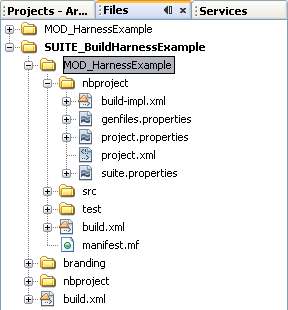 File structure showing the suite folder and the very first entry point into the build harness. Before we continue on to the other folders, let’s add a new module called MOD_HarnessExample to the suite and see what happens. Figure 5. The file view after adding a new module. The new module is created by default inside the suite folder, as seen above. For the purpose of this example, that is perfect. Note that the module has its own build.xml file and nbproject folder. It contains a file we have not encountered yet – suite.properties. It specifies where (relative to the module) the suite that it belongs to is located. The module has no platform.properties files – it inherits those properties from its parent suite. The build-impl.xml for a module imports the build.xml file from the harness. Note that a module can also be created as a standalone module, in which case it has no suite.properties file and has its own platform.properties. Figure 6. The file structure, now including a module. So when the platform.properties file specifies nbplatform.active=default, this refers to the platform as specified above. Remember that the harness folder can be specified independently of the platform folder, so do not assume for platforms other than the default that it will be inside the platform folder. Figure 7. The file structure, showing the relationships of the build.properties file. Figure 8. Finally the entire structure.